A young woman's genuine desire and determination to serve her country in the US Navy becomes a heart-wrenching first-person accounting of her efforts to overcome the trauma of multiple rapes spanning five years and four duty stations while she continued to serve her country with honor and dignity. 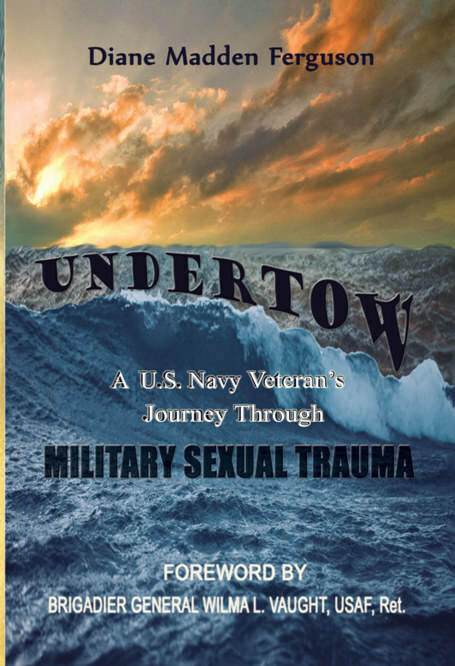 Her struggle to uncover the 40-year secret she has kept and address the horrors of Military Sexual Trauma (MST) brings the reader to the very core of her agony in a journey of full disclosure and healing. Diane Madden Ferguson is a US Navy veteran and retired law enforcement officer. She is a graduate of Benedictine University with a Master’s of Science in Management and Organizational Behavior. Undertow is Diane’s first book. Her paper on "Gender Specific Stress in Law Enforcement" was published in the Western Illinois University Online Law Journal's very first issue in 2010. Diane’s personal experience with MST compels her to share her journey in a mission of caution and comfort to those serving in our military. It is her hope and intention with this memoir and her website to create a platform to enact change and create awareness of the magnitude of this pervasive issue within the military culture. Diane has now been married for 38 years and living in the western suburbs of Chicago where she has been blessed to raise a family with her husband, Michael. With all children now grown adults, Diane and Michael cherish the comfort and companionship of each other and their Boston Terrier.